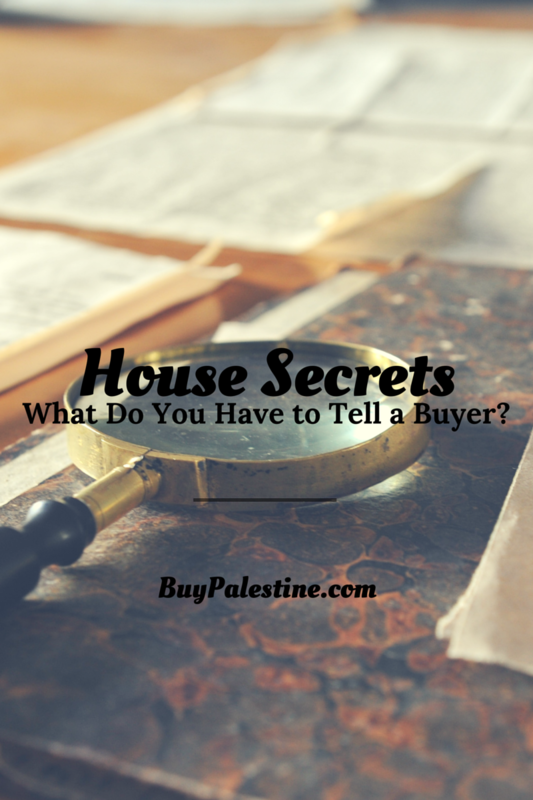 Palestine Real Estate & Palestine TX Homes For Sale | BuyPalestine.com House Secrets: What Do You Have to Tell a Buyer? Sellers want to sell “as is” and buyers want to know anything and everything about the property. How in the world can these two vastly different outlooks come together to complete a sale? Disclosure, that’s how. Full disclosure is an important part of the buying process and buyers want (and deserve) to know exactly what they are buying—the good, the bad and the downright hideous. When selling, it is important to know how to disclose information about your property, so you can complete the sale within the legal guidelines. The end goal is a happy buyer who knows the ins and outs of the property and a seller who can sleep soundly at night knowing he sold a home with no secrets. Well, quite frankly, you might—but the truth is the truth and honesty is always the best policy. There is no such thing as too much disclosure in real estate. The Texas Property Code sets forth guidelines on who, when and what must be disclosed. All single-family residential sales must include a seller’s disclosure. Of course, like any rule, there are a few exceptions. Section 5.008 of the Texas Property Code lists several common exceptions, including a foreclosure sale, an administrator of an estate or trust, a spouse or lineal heir and new construction that has never been occupied. Notice that a “For Sale By Owner” transaction is NOT exempt from the requirement, even if there is no Agent involved in the sale. In general, most residential sales require a disclosure notice. The Texas Association of REALTORS® Seller’s Disclosure Notice is 5 pages and covers everything from the age of the roof to the current utility providers. However, some disclosures are not as simple as checking off a box on the form. Do you need to disclose a death on the property? Yes and no. You do not have to disclose if the death was by natural causes, suicide or unrelated to the property condition. You do have to disclose a murder or a death caused by the property itself (such as an accidental electrocution by faulty wiring in the home.) Do you need to disclose a prior water leak, even though it was repaired? Absolutely. I won’t go over every possible scenario, but as a general rule, even if you are not required to do so, it is in your best interest to disclose it. You want to be the source of the disclosure and avoid any potential litigation. It is guaranteed that your “secret” won’t stay secret for long. It will come out somehow—maybe when a gossiping neighbor spills the beans to the buyer when welcoming them to the neighborhood with a fresh pie. Just don’t go there—spill your own beans and protect yourself from any potential litigation by being upfront and honest about all issues. Lying by Omission is Still Lying! The bottom line when it comes to disclosure is simple and used often in the world of real estate—disclose, disclose, disclose. This is likely the biggest asset in most people’s lives and is not a time for deceit or shadiness. Anything you know, you have to tell. Disclosure forms are a kind of property history checklist from top to bottom and throughout the known history of the property. It gives the buyer information on the structural and mechanical systems of the property and any ongoing issues, hazards or past problems. Don’t assume this is a bad thing. Put yourself in the buyer’s shoes—wouldn’t you want to know? Of course! Disclosing the whole truth is not going to scare away buyers, it will protect you. After all, there is no such thing as a good long-held secret. Lisa E. Priest loves nail polish and is a local REALTOR® and Property Manager with Picket Fence Realty, Inc. You can reach her via phone or text at 903-948-3343 or at BuyPalestine.com.